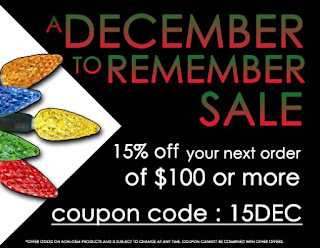 A December to Remember Sale - Save 15% On Orders $100 or More | TonerGreen - Eco-Friendly Toners from the U.S.
Get 10% Off on Order $300 or More! Jingle bells ringing, snowflakes dropping and children singing Christmas songs... Oh, couldn't you just feel the Christmas spirit all over the town? If yes, then you're definitely up for some early Christmas treat, TonerGreen, your provider of eco-friendly printer supplies, is giving away 15% off on all orders of ink cartridges or toner cartridges $100 or more as a part of our December to Remember Sale. Save on your order eco-friendly, U.S.-made remanufactured toner cartridges and ink cartridges by just typing in coupon code 15DEC at the designated coupon code box to be found at the checkout page. This will automatically apply the discount on your order. And since we always offer free-shipping on orders $50 or more, with our December to Remember Sale, your shipping will be free as well. This promo is valid until December 9 and is not valid on OEM products nor be combined with other coupon codes or on-going promotions. So stock up your Christmas stockings with our December Sale Event!